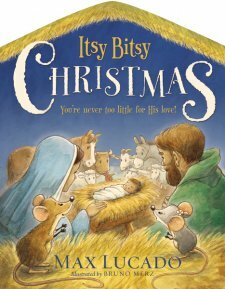 Itsy Bitsy Christmas by best selling author Max Lucado is the perfect gift for the little one in your life. I had to run into Dollar General quick to grab a few necessities. In the midst of those candy bars your kids are always eyeing but know they can't have, I saw the first sign of Christmas. It was subtle, but it was there. Santa Claus pens. While waiting for the super slow line to progress, I eyed this oddity trying to believe it. Christmas pens for sale, in September. I guess it's not that odd anymore these days, but it's still hard for me to wrap my mind around. Christmas is coming. Fortunetly, I do my shopping year round so that isn't a huge stress for me right now. I like to hunt and gather. Deals, and fun Christmas goodies for the little ones are fun to find at random times during the year. Itsy Bitsy Christmas is one of those fun finds. This book is certainly as cute is it's name. I chose it simply because it appeared to be geared towards itsy bitsy little children. The subtitle even says,"you're never too little for His love." While this is the theme of the story, the name of the book also describes the main characters, two sweet little mice who share their journey with us about the coming of the King to their humble stable in the town of Bethlehem. The engaging text, earthy images and beautifully constructed board book is just what the little one in your life needs this Christmas! Little hands will love it's large textured cover and the contents inside. Young children will enjoy this sweet take of the Christmas story from the perspective of two little ones themselves. Disclaimer: This book was provided by Book Look Bloggers for the purpose of this review.